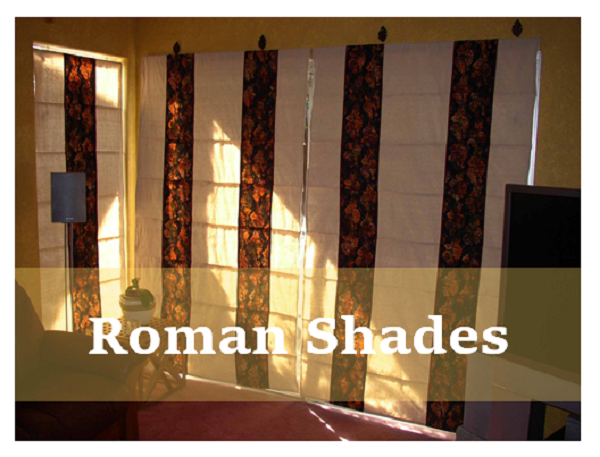 Roman shades are modern and stylish window treatments made from fabric. Categorised as soft window treatments, Roman shades can be used to add a stylish minimalist theme to an interior space. Unlike blinds, shades have no adjustable vanes or slats that help you adjust for daylight filtering, rather, they came in various types with different levels of opacity. Roman shades offer a clean, smooth look that is elegant without being overbearing, like heavy curtains and drapes. Its streamlined look works well with rooms that have small to medium sized windows. This doesn’t go to say that you can’t use them for wider windows. However, with wider windows, you may need to install two or three Roman shade panels. How you install Roman shades depends on the type of windows you have. If you have beautiful window openings with mouldings, trims, and elaborate sills, then it's best to fit them inside the window. This will keep the architectural details in view. However, if you have non-descript or plain windows typical of modern homes, it is better to mount the shades on the outside of the window frame. 1. They stack up evenly in horizontal folds when opened. 2. They are visibly smooth with a clean uncluttered look, and without bump or creases. 3. New innovations in liners and operating systems. 4. Can be raised or lowered with the help of a cord system and rings sewn on the back of the fabric. 6. Roman shades are available in both rolling and stacking options. 7. Durable and easy to clean. 9. They usually have a neutral colour back lining for a smooth consistent view from the outside of the building. 10. Roman shades can be customized to feature curved bottoms, embellishments, tassels, embroidery, fringe, or other types of bottom trims. 11. Thermal or blackout liner for energy efficiency, light blockage, and complete privacy. 12. Can be equipped with cordless operation for both convenience and child safety. Roman shades have a wide price range, from the cheaper versions to the much more expensive ones. Prices tags will depend on the fabric used, the features they have, and the type of operating system they possess. 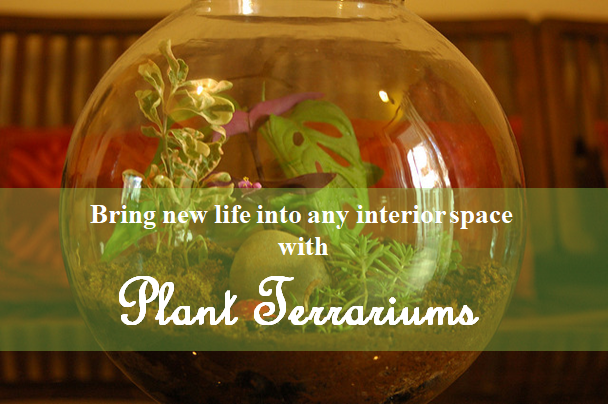 A terrarium is a glass container that holds natural plants, pebbles, rocks, and soil. It is an ornamental piece of a natural setting that makes a great table or shelf display for your living room, foyer, or bedroom. 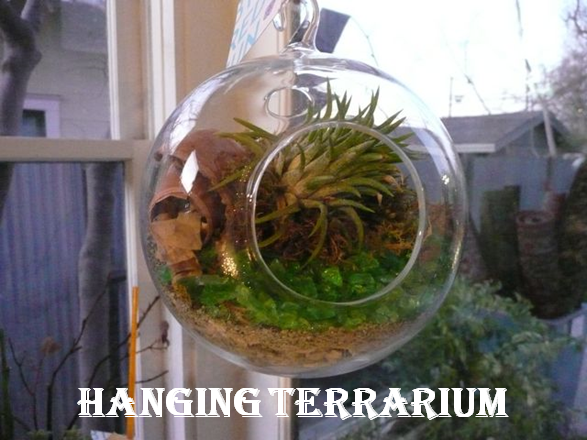 There are two types of terrariums, the open ones and closed kinds. While the open terrariums are open to the atmosphere and contain dry-weather plants that need the occasional weekly mist, the closed terrariums contain vegetation that requires a moist environment to thrive. The glass walls allow for both heat and light to enter the terrarium. Aquariums and terrariums have some similarity in that they are glass containers, but while one contains fish in a natural environment, the terrarium contains a mini garden, kept in a unique environment that’s conducive for plant growth. The kind of plants grown in terrariums depends on whether they are the open or closed types. Examples of plants that thrive well in open terrariums are succulent plants like cacti, aloe vera, and jade plants. Closed terraria contain moisture-loving plants like ferns, moss, air-plants, and orchids. 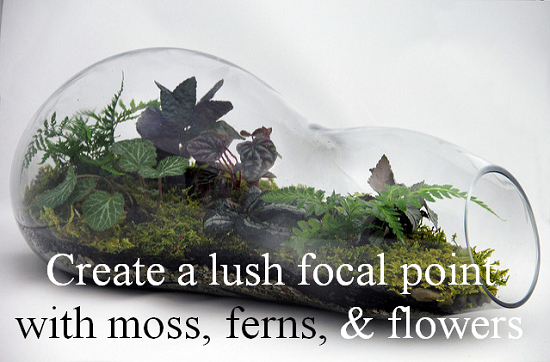 If you like interior décor objects with a natural setting, you will love terrariums. It is like a mini garden or forest enclosed in its a little world. You can create one yourself because they are quite easy to build as long as you use the right plants conducive for the different types of terraria, the open or closed system. You can also purchase them if you are not a hands-on individual like many of us. Great for creating a mini-oasis atop your study desk. On a floating shelf, set at eye level, no higher than 5’0” from the floor. 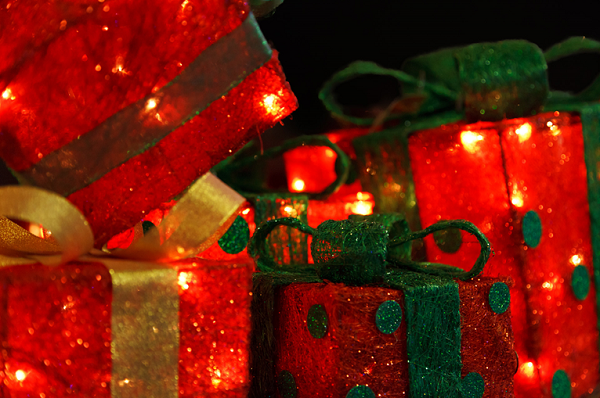 As a display item on the foyer console. As a centrepiece for your dining table. As a piece of furniture on a stand to serve as a coffee table, just like an aquarium coffee table. In the bathroom, you can hang a teardrop terrarium with an adjustable hanging rope. As decoration object displayed on a chest of drawers in the bedroom. Hang it solo to round out an empty corner or grouped with similar pieces for a stunning display in any room with ‘dead’ corners. Closed terrariums are self-watering. The mini garden releases water vapour which collects on the glass walls of the container and trickles down into the soil. Because they are self-nourishing the plants in closed terrariums require very little maintenance. Every terrarium has a drainage layer of charcoal (or gravel) that ensures excess water drains away from the soil and prevent root rot. Curtains and other types of drapery are an important feature of your interior space. Without window treatments, a room will look incomplete. When curtains are well installed, they can transform a lack-lustre wall into an elegant feature that becomes an integral part of the décor and art featured in the room. Curtains come in various forms, styles, fullness, and lengths, and include pinch- pleated drapes, cased-heading curtains, box pleated, eyelet, tailored pleat, tab-top, and goblet curtains. 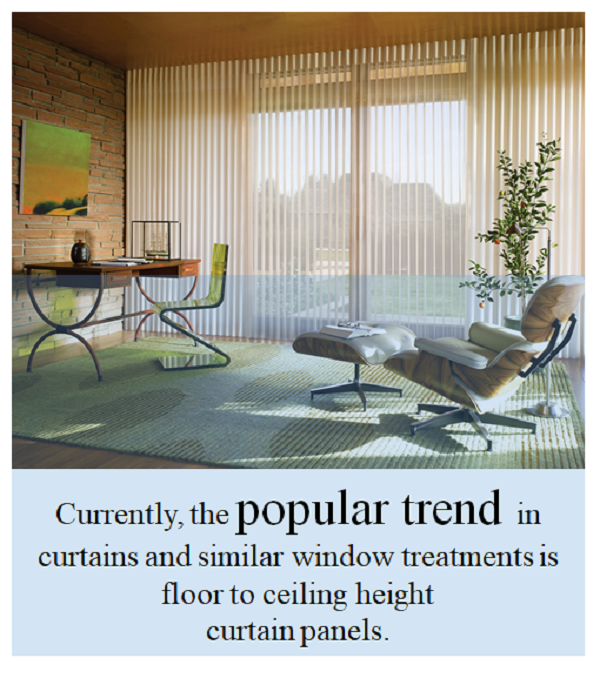 Currently, the popular trend in curtains and similar window treatments is floor length ceiling height curtain panels. They are hung with iron rods or other decorative curtain rods with different styles of finials. Because they are the final feature that completes a room's design, it is important to know the best ways to hang them, and how high to install them so that they become an enhancement to other interior décor elements. For a professional and stylish look, the height that is most appealing is the full wall height, meaning a drop from the ceiling. That complete vertical adds a great dimension to the interior design and gives walls the illusion of extra height. For those who prefer not to install their curtains at the ceiling height, it is important to position the rod a minimum of 6” from the top of the window and a maximum of 12” above it. 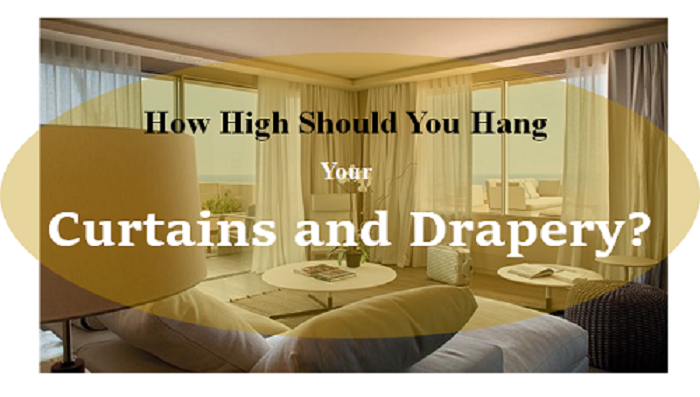 If you have high ceilings, you must go higher so your window treatments don’t appear squat. So, the higher your ceiling, the higher your curtains must be installed. If you are using a valance or swags, install them so that their top ends are about 12” to 15” from the ceiling if you have high ceilings. if your ceiling height is low, install your curtains with a gap of a maximum of 12” from the ceiling. To summarize it all, the most important rule for beautiful and professional-looking window treatments is to hang your curtains and drapery high. One trick you can employ to make your curtains appear taller and make them more eye-catching is to combine two window treatments. This adds to the design of both the wall and the interior space. To achieve this, hang the curtain rod at least 12” inches above the window and hang bamboo shades or roman blinds directly under the pole. When the curtains are drawn open, and the blinds are pulled one-third way down the window, it will conceal the blank wall between the rod and the window frame. Remember to leave an allowance of about 1” from the curtain hem to the floor, to allow for cleaning. Extend the curtain rods beyond the width of the window by a minimum of 4” on each side. This measurement must be taken without the finials, to give the illusion that the window is wide. Steam iron the curtains to remove any wrinkles because if you think that the wrinkles will “fall out” in time; they will not. Indoor water features are decorative pieces of art that are meant to have both pleasing and beneficial effects on our emotions and personal well-being. Calming and invigorating, an indoor decorative waterfall is always an eye-catching addition to any interior and an interesting conversation piece. Indoor water features - A good enhancement for your interior space. With examples that include table-top features, indoor water fountains, standalone water features, wall-mounted waterfalls, and collection ponds, indoor water features have become a popular home décor item in many households. And because they are quite affordable and versatile, they can be placed in any room; in different parts of the house. Display methods vary, and placement will depend on your own taste, creativity, and available floor, table-top, or wall space. This means that they can be positioned in a variety of areas and in a variety of ways. They are perfect as a focal point within any room because, with a water feature display, other furnishings and furniture in the interior space will appear tasteful. Porch – If you have a good-sized porch, you can place a standalone water feature, a fountain or pond-like feature. 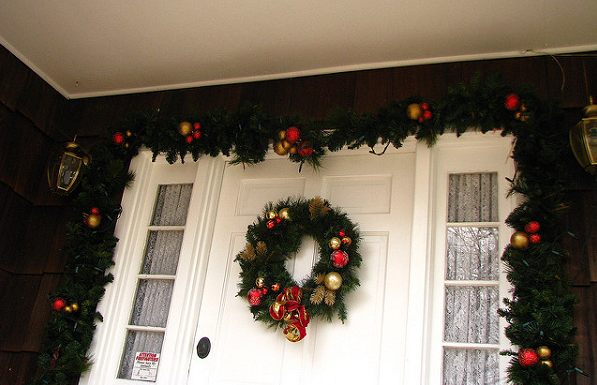 This can be complemented with small potted plants to give your porch a natural scenic look. 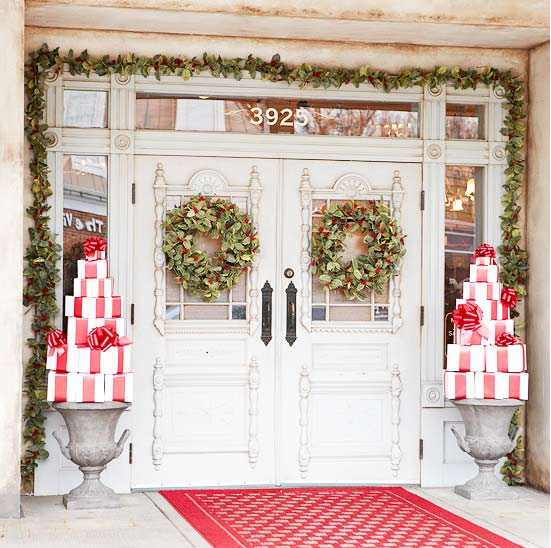 Foyer – Set in a position, preferably across from the entrance door, water features welcoming visitors into a home have a mood-lifting and calming effect. Wall fitted waterfalls usually works best because they barely take up floor space. 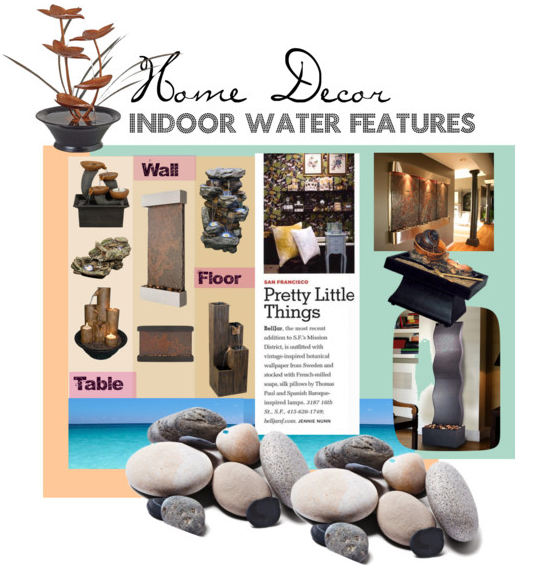 Hallway – Display a table-top water feature on a hallway console set against the longer wall. Living Room – Table-top water features look great on coffee tables. Not only do the soft sounds of flowing water calm the nerves, but they also lend an aesthetic attraction to a living room’s interior décor. Indoor feature walls - A wall-mounted waterfall unit will turn a bland wall into a feature wall. Many come with remote control options, so you can enjoy its beauty and control its falls without having to get up from your seat. Niches - If you have a niche or a corner and don’t quite know how to make it an attractive spot, place an elaborate water feature like standalone waterfalls. You can also install a wall waterfalls unit and create an arrangement of potted plants on the floor surrounding the falls. Bedrooms – Indoor water features are great for bedrooms where the gentle sounds of water can calm and lull some insomniacs into a peaceful fret-free slumber. For bedrooms, the table-top designs can be placed on a bedside table (some come fitted with lamps), or on the dresser or chest of drawers. Study – Work on your workstation or study with the gentle sounds of flowing water. The sounds of nature like rainfall, rustling leaves, or rushing water are natural white noises that can drown out annoying noises. This leads to a better concentration and an enhanced focus, important requirements for working or studying. Courtyards and Atriums – You can bring the outdoors indoors with water ponds or fountain features, plants, smooth pebbles, rocks, etc... A setup with natural items will certainly draw lots of compliments from guests. Water features are made with different materials that range from ceramic, slate, and terracotta, to stone, granite, marble, bronze, glass, and simulated (faux) natural materials. There is always one that will work well and look best for any interior design concept.